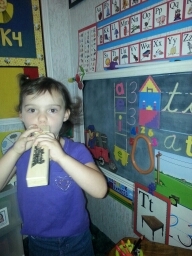 “I mean, why can’t kindergarten be longer?” she insisted very emphatically. “Well, we’ve finished all of our school work for today, and now it’s time to play. Don’t you want to play?” I encouraged. Add a vowel to the train engine to make a blend. You’d never believe what an agonizing time this is for our three-year-old, until finally Mommy is finished and a “peek” is allowed. 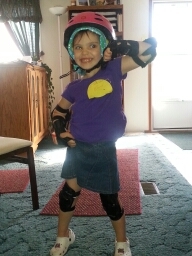 Excitement constantly bubbles in our house and frequently erupts with gasps, giggles, and glimmering eyes. 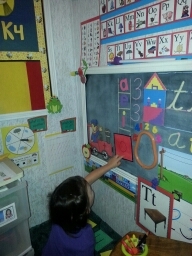 Much was the case when she saw the Choo-Choo train on the board and whistle that she would get to try out. Toot! Toot! All aboard the K4 train! Mommy was just as eager because that lesson introduced reading blends. READING – this is soooo exciting. “A blend is a consonant and vowel put together and sounded together,” she chanted with Mrs. Pintar. She added cars to the train, made a blend, and blew the train whistle. No chug-a-chug-a in this class. AbiNoelle read the blends with a Whoo-Whoo-look-out-I’m-steaming-through! 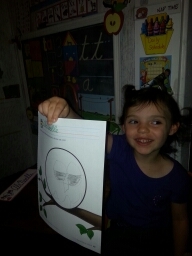 Skills time had some “hoots” too with our first directional drawing with Mrs. Pintar. These drawings take lots of listening and diligent effort, but with careful attention, the end result was impressive. Is that a puppy dog doing AbiNoelle’s writing paper? Steady she goes in cursive writing practice! 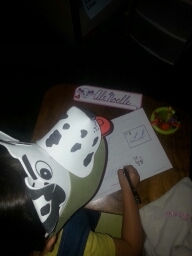 This is a challenge, but AbiNoelle is so delighted when she can write a letter by herself, without tracing. Her face beams when she observes her final work. 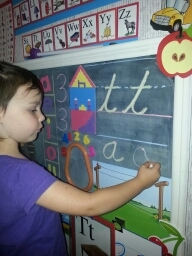 Look, I can write little “a” all by myself! 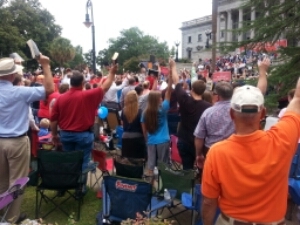 Friday, we were privileged to be able to finish school and responsibilities in our office and head to South Carolina where we stood with 10,000 others at the state capitol to voice that #WeStandWithGod. Getting to try on this soldiers hat. 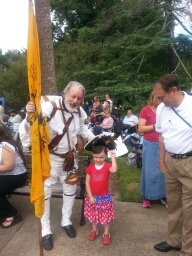 I love America! 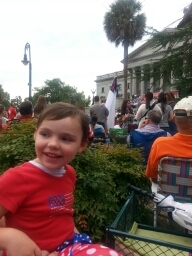 Of course, AbiNoelle has been learning in K4 the Pledge of Allegiance and its significance, My Country ‘Tis of Thee, The Star Spangled Banner, and for a couple of years now she has been learning about the founding fathers and the true history of America. What an honor to be able to add to that learning as we stood united with thousands of other Christians in letting our voice be heard regarding Biblical family values, traditional marriage, religious freedom, and having the opportunity to stand against abortion and Planned Parenthood. Thank God for the many we heard from like Ted Cruz, Rick Perry, and other Patriots who are fighting on the firing line for those beliefs. We pray for America, and are thankful that, today, she is still a country of freedom where we can teach and train our daughter according to God’s Word. Loved this lesson , so excited to read about her lessons as she does them.